This article is about the London bus operator. For the Singapore operator, see Tower Transit Singapore. Tower Transit is a Transport for London bus operator. It is a subsidiary of Transit Systems. 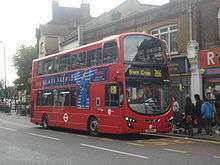 In June 2013, Transit Systems purchased First London's Atlas Road (Park Royal), Lea Interchange (Leyton) and Westbourne Park garages with 24 London bus routes and 412 buses. Also included were contracts to operate three routes (425, N550 and N551) that had yet to commence. In October 2014, Tower Transit purchased the Impact Group which operates 130 small buses for local authorities and schools out of depots in Ealing and Croydon. Tower Transit operates three bus garages. 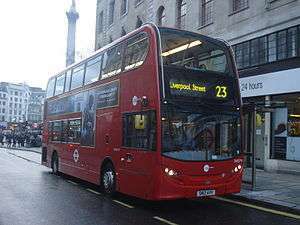 As at May 2015, Park Royal garage operated routes 28, 31, 266, 328, N28 and N31. On 1 October 2011 this garage opened when part of Westbourne Park garage was closed to make way for Crossrail construction works, with operation of routes 28, 31, 328, N28 and N31 transferred. Atlas Road operates as an outstation for Westbourne Park, so buses are seen on Atlas Road routes and vice versa. As at June 2016, Lea Interchange garage operated routes 25, 30, 58, 69, 212, 236, 308, 339, 425, 444, 488, N26, N550, N551, RV1, W14, W15. The garage opened in 2007 to replace the Waterden Road, Stratford garage that closed as part of the development of the Olympic Park for the 2012 Olympic and Paralympic Games. Waterden Road was opened in 1996 after a number tender wins. Lea Interchange will begin operating route 69 on 30 April 2016. CT Plus will take over operation of route 26 on 25 June 2016. Westbourne Park Garage was part of the re-construction programme undertaken by London Transport in the early 1980s. As was common practice at the time, the new garage replaced two older garages - the small and inadequate Middle Row (X), and the larger former trolley bus garage at Stonebridge (SE). The new garage, which opened in 1981 in Great Western Road, and is of unusual design in that it is built beneath the elevated A40 Westway, the roof of the garage being profiled to match the concrete flyover. Originally, the garage allocation consisted of AEC Routemasters, and a small number of DM to B20 "quiet" specification for Route 18. These were supplemented in 1983 by a number of Leyland Titan of T class for comparative trials. A new 180m bus parking area is to be built on a raised platform over railway lines as part of the Crossrail project. Metroline took over the operation of route 295 on 31 October 2015. On 5 March 2016, Westbourne Park took over the operation of route N97 from London United. In August 2014, Tower Transit lodged a development application to build a new garage in Pickett's Lock Lane, Edmonton with capacity for 107 buses. As at May 2015, the fleet consisted of 437 buses. ↑ "FirstGroup Announces Sale of Eight London Bus Depots". FirstGroup. 9 April 2013. Retrieved 23 June 2013. ↑ "Tower Transit announces First Group partial acquisition". Transit Systems. 9 April 2013. Retrieved 23 June 2013. ↑ "Date set for Aussie takeover of London bus routes". Australiasian Bus & Coach. 14 June 2013. Retrieved 23 June 2013. ↑ Hurst, Brian (12 June 2013). 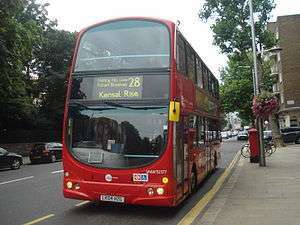 "Redland company takes wheel of London's big red buses". Brisbane Times. Retrieved 23 June 2013. ↑ Carr, Ken (May 2015). The London Bus Guide (5 ed.). Boreham: Visions International Entertainment. p. 113. ISBN 978-0-9931735-3-0. ↑ Carr, Ken (May 2015). The London Bus Guide (5 ed.). Boreham: Visions International Entertainment. p. 116. ISBN 978-0-9931735-3-0. ↑ "Tower Transit - Bus Garage Locations". Retrieved 14 November 2015. ↑ MacLennan, Peter. "Crossrail Awards Padington New Yard Contract". Crossrail UK. Crossrail UK. Retrieved 1 November 2014. ↑ Carr, Ken (May 2015). The London Bus Guide (5 ed.). Boreham: Visions International Entertainment. p. 42. ISBN 978-0-9931735-3-0.